We knew we wanted to capture a mood of both money and business, along with sustainability and earth. Aquamarine blue represents liquid and fluidity. Nature off-white represent environment. Yellow used to highlight and show the difference. And we also setting up the black, gray, white colors’ using rule in the beginning. We made a standard template include layout, Front, hierarchy (Title / Subtitle /Introductory Text/ Explanatory Text / Axis labels/ Notes on how certain measurements are taken/ Citations/ Group Names/signature), So everyone can just follow the template and make our visualization consistency. We begin with earnings per share of stock in each company. This graph demonstrates the financial earnings an investor would make per share of stock. You see the mean over a 4-year stretch from 2010-2013, as well as the earnings for each year in that period. Looking at this visualization, you see that pepsi will get you the most bang for your buck, so based in earnings alone, you might decide to invest in PepsiCo. Next we look at the emissions and water used in the manufacturing process for each company. These graphs demonstrate both overall CO2 emissions per company, as well as the ratio of emissions per liter of product. 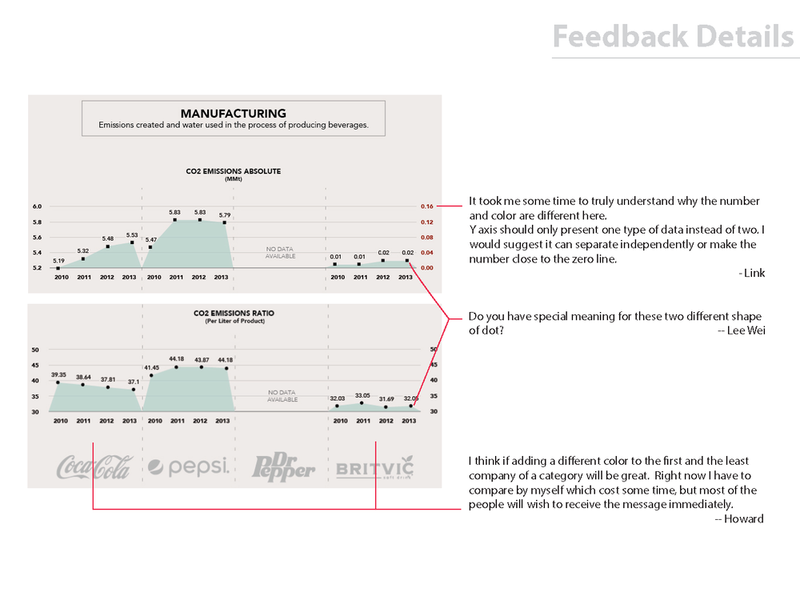 We chose to show both because you might notice that in Coca-Cola’s case if you were to look at emissions per product you would believe that they are polluting less. However, you see by looking at overall emissions that production has increased, so they have increasing emissions overall. Lastly, when you look at Britvic, you see that while they are a small company and don’t contribute high CO2 emissions, they also are not very efficient in their ratio per product. We’ve also included the water used per liter of product to give another dimension to the manufacturing process. You’ll see that DR Pepper/Snapple is quite a bit higher than the other companies. They also don’t report on their CO2 emissions. We then decided to look at what comes out of the backend of the manufacturing process. Here we look at the waste produced for each company. And while there is data missing for Dr Pepper/Snapple and Britvic, you can get a sense of the recycling rate at Dr Pepper Snapple, and the rather small amount of waste set to landfill for Britvic. Lastly, we look at how much each company invests back into communities through contributions, volunteerism, and programs. Because the overall revenues of these companies vary so greatly, we compared how much they invest in community per $100 they earn. You can see here that Coca-cola and Dr Pepper/Snapple far outpace their competition. We chose four beverage companies who released financial reports and annual CSR (Corporate Social Responsibility) reports sharing their progress. Then, set up our purpose for this data visualization and categorized and cleaned data for later visual design usage. This series of visualizations is meant to be presented as a scroll down series. Taken altogether, you begin to see that the money you make investing might not be the only thing you want to take into account when thinking about the overall impact of each company over time. The visual takes the viewer from investment, through the manufacturing process, beginning to see images of the earth and the people on it. Our point, captured in the title, is to show that the social and environmental impact of companies is important to think about when deciding where to invest, or how to analyze a company. When we shifted away from B-Corps to public corporations, we still wanted to capture social impact. This series allowed us to do that, although finding the data was definitely a challenge! Another thing we learned is that many companies are happy to report on percentage improvement, but finding hard/actual numbers was much harder and some of the companies were much less transparent about those numbers, leading us to find them from other sources. 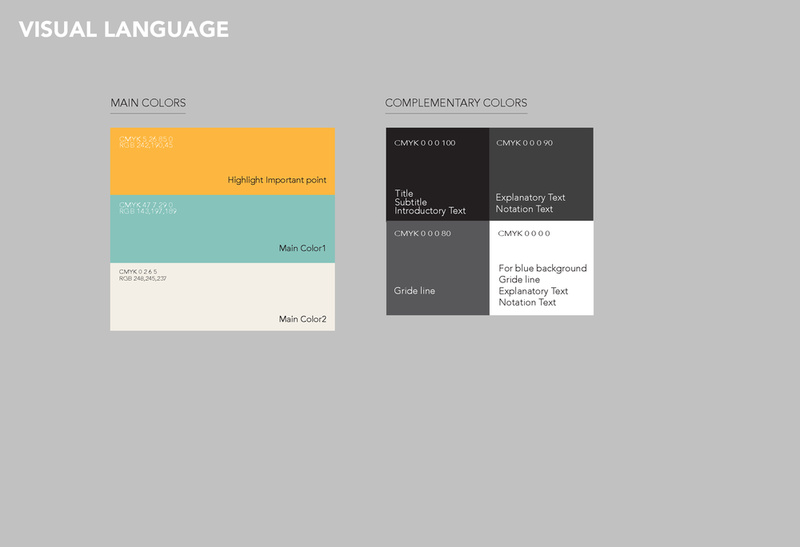 The purpose of this version is to practice deeply focused attention to color choices in data visualization, as well as practice listening to and incorporating feedback into my color choice. In this practice, it's not merely about the visual and data. It also relates to how users access your information and understand the content. Based on the feedback I got from 7 users, I changed the color and a bit design to make information design more accessible and user-friendly. 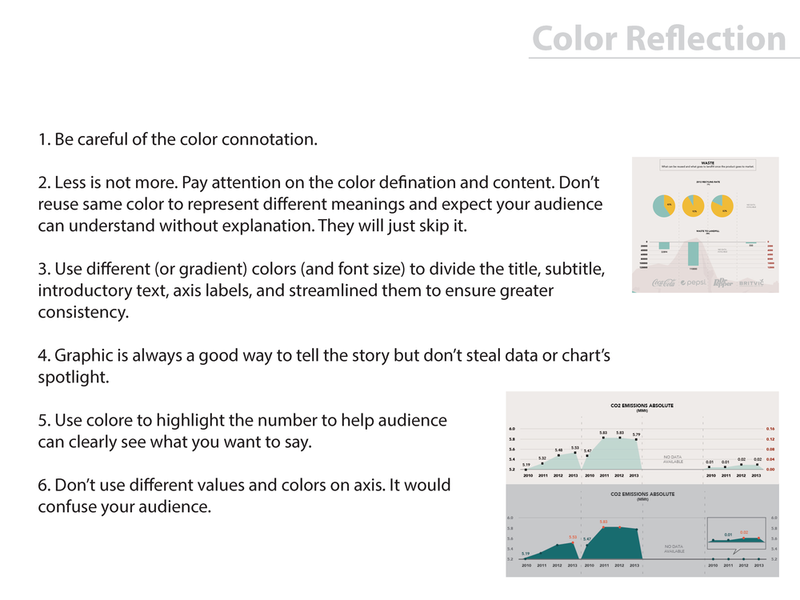 I really enjoyed in this project during the process of trying to understand different people's perspectives of color and the digestibility of the data visualization. I would love to explore the conversation with anyone if you are interested to discuss the information accessibility design with me.